The question of how much to knead bread dough, and how one can determine how much kneading is ‘enough’, is one that often causes the beginner great angst. There is much to be said on this subject, but it isn’t today’s topic. What I’m interested in here is how much is too much? It’s not often that I’ve been asked if you can work bread dough too much; presumably it’s not something that worries many people. Nonetheless, I have been asked, and the answer is that yes, you can over-knead dough. So, what happens when dough is over-kneaded, and how likely is it that you might inadvertently do it? The answer to the second question depends on how you knead your dough. By hand, or even using a stand-mixer, it is virtually impossible. It can be done using a powerful food processor, however. For some years I’ve owned a Magimix Cuisiniere 5200 food processor. You could mix cement in this machine. It’s an 1100 watt animal. For making bread it’s really a bit of a blunt instrument, as it has no speed control, but it is capable of thrashing the Hell out of a lump of dough very quickly. A minute or two is easily equivalent to 15 minutes kneading by hand, making it a suitable instrument for finding out what happens when dough is over-kneaded. For my experiment I used a dough made with 500g strong white flour and 300g water. As a baker’s percentage that is 60%: a firm, not too sticky dough. I used the Magimix to knead the dough for two minutes, then ran it again for a minute at a time, observing the effect on the dough. The video below (my first foray into the world of moving pictures!) documents the results. After another minute, the dough was noticeably stickier than previously and was beginning to stick to the sides of the bowl. After four minutes, the dough was wrapping itself around the blade and shaft, as well as sticking to the bottom and sides of the bowl. The motor was beginning to labour because the blade was now having to cut through the sticky mass rather than moving it around the bowl. The dough had become a smooth paste that formed strands when stretched. As the five-minute mark approached, the dough-blade was almost coming to a halt with each revolution and the motor was ready to cut out. By now the dough, if it could still be called that, had acquired a stringy, putty-like appearance and was very soft, in stark contrast to the dense, stiff consistency it had before kneading. In fact, it was so soft that some of it had worked its way up inside the hollow stem of the blade and escaped down the bowl’s central shaft. Despite its softness, it had lost much of its extensibility: when stretched, it tore easily. This indicates that the gluten network has been damaged, because it is gluten that gives bread dough its stretchiness. The web of gluten strands that kneading had developed and strengthened earlier in process had been physically broken down as mixing continued. Extracting the over-mixed dough and cleaning up was difficult because it was so sticky. Although only 60% of water by weight of flour was used, it is about as sticky as I would expect a dough hydrated to 75% or more to be. The dough did rise, though not as much as I would normally expect. Proved in a loaf tin, it didn’t quite reach the level of the rim. I would normally expect that quantity of dough to have risen above the edge of the tin by a centimetre or two. On the other hand, I must allow that quite a bit of dough was left behind in the mixing bowl and on the dough blade, so the standard I was judging it by was a bit unfair. In retrospect, I should have weighed it. I baked it at 220c for 35 minutes. There wasn’t very much in the way of oven spring, and the top of the loaf didn’t form a pronounced crown, but by no means did it look like a conspicuous failure. After leaving it to cool overnight, the moment of reckoning came as I cut through the middle of the loaf. 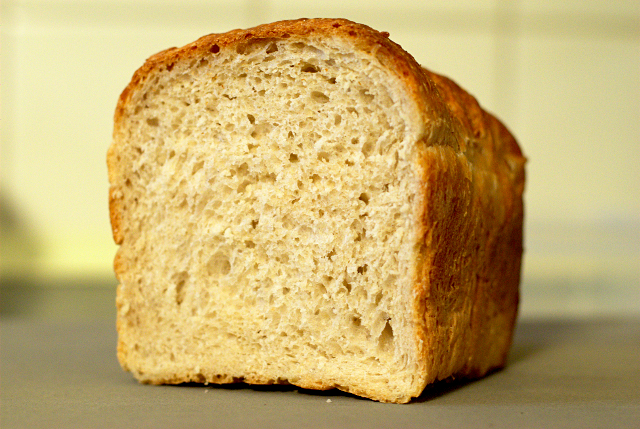 I was quite surprised to see that the crumb was quite open and airy, rather than dense or even under-baked. It had a slightly gummy texture, but otherwise it seemed not much worse off for having been over-mixed. In any event, this experiment shows that over-kneading dough is not an easy task even with powerful domestic kitchen appliances. To do it by hand would require Herculean effort, and it’s hard to see how a person could do it accidentally. Unless, perhaps, that person actually was Hercules. Very useful info. Thanks. It would be great to repeat the experiment with other flours. I generally use 30% rye flour and it would be interested to see how this fares. I think rye can be overkneaded more quickly, so getting the knead time right for a white/rye mixture is not so straightforward. Rye is a funny one. It contains less glutenin than wheat flour so, although gluten does form when it’s hydrated, the dough is less extensible. A 100% rye dough relies almost entirely on its starch content for its structure, rather than the gluten in it. I think I will have another go at the experiment to see how different flours and combinations of flour respond to mixing times, so keep checking the blog!